Breaking Dawn is the fourth and the last of the much acclaimed Twilight series. I am not much of a paranormal fantasy book reader. In fact, the twilight series is the only what I have read in this genre. That too, after my friend recommended it to me. 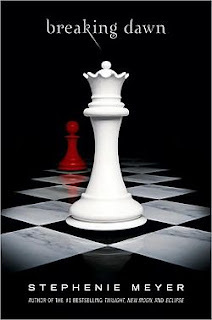 Breaking Dawn is a continuation from the last book of the series, Eclipse. The first part of the book is all about the marriage of Bella and Edward followed by a honey moon in the lonely and far off Esme Island. It is during the honeymoon, Bella realizes there is something seriously wrong in her. It comes as a surprise to her that she is pregnant, actually very pregnant and that too in a span of time that is humanly impossible. But, then the thing growing inside her is not human. It is a culmination of vampire and human. No one knows what it would be. But, one thing is for sure, it is slowly devouring Bella inside out. This little thing growing inside her changes the equations of relationship among people around her. Friends become foes and enemies becomes friends. The relationship with Jacob takes a whole new dimension. The author has used a lot of imagination and the story is full of twists and turn. I can't really delve into details of the story line. That is very much a thing to read in the novel. But, I do have some issues with the story. First thing, the story by the end was neatly tied in a bow. There were no loose ends. Every one gets what they want. I don't mean I like sad endings but, to me the ending seemed too perfect to be true. That took away a lot of charm and awe I had for the series. Bella had never been my favorite character nor had been Edward. Bella had always been portrayed as a clumsy, inefficient being and after being immortalized, she is the most gifted one, as if she was born to be immortalized. In fact, I have read that the cover page of the book signifies exactly that. From being the most insignificant player, she becomes the most powerful one. The title of the book also signifies Bella's new life. My problem with Edward is that he is too good. I mean loving one is fine. But giving in to the irrational demands of your beloved is not the right thing. I loved Jacob Black's character. He was the only one who seemed to be real to me but then I lost him when he imprinted! Also, I couldn't digest the fact that the battle with the Volturi ended without much of a combat. I wish there had been more action on the ground rather than in the mind. Of the whole series I liked the first book most. It was a page turner for me. In the following books, there was too much of sulking on Bella's part, too much of eternal love from Edward. Only Jacob Black kept me glued to the series. I give it to the author for her incredible imagination. The story came a long way from the point it started. It had been a tumultuous journey for Bella. So, it has been for the reader. All in all it was a different experience reading the series. Good for easy and light read, nothing more.